You are here: Home / Uncategorized / Thinking about selling your home? Here are some helpful tips! Thinking about selling your home? Here are some helpful tips! 1. First impressions are key! I was showing clients a nice home the other day, but it was not freshly painted and had lots of cracks in the drywall. This put off the potential buyers as they were worried about foundation problems, cooling/heating problems, insulation problems, etc, and they saw a lot of wear and tear on the existing paint (smudges, scrapes, dents) which led them to believe that the house was not well taken care of. 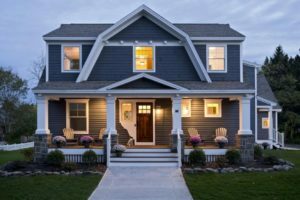 The cracks were all just part of natural settling that occurs in many homes and if the homeowner had taken the time to repair the cracks and paint the interior, the home would’ve shown like new and impressed more buyers than just mine. 2. Price it right! Typically, homeowners like to think that pricing their home high to begin with is the best strategy. In today’s competitive market, homes are going quickly and often, at above asking price. The first 30 days is where you’ll see the most activity and if the price is too high, buyers will stay away, assuming you are not serious about negotiating. A typical good approach your Realtor will help you with is to get recent comparable properties that have sold in your area and use them as a guide to price your home competitively. 3. People do judge the book by it’s cover. If your curb appeal is lacking, some people will not even venture to go inside. You may need to spruce up your mailbox, add a planter, pull weeds, plant flowers, ad d new sod or paint the front door. Entice potential buyers to come inside! 4. Declutter! The less junk you have inside, the bigger your home will feel to potential buyers! Make sure things are organized and only necessities are left out. Get rid of the knickknacks, religious photos and family photos. People want to see themselves living in your home. Consider having your realtor or staging professional stage your home with either your existing furniture or staging furniture. This makes a huge difference! Presentation is everything! If you have to box up all your belongings and move them temporarily to a storage unit, do it! You will sell your home so much quicker and for a higher price! Also, clean your carpets and deep clean every area—you may want to consider hiring a cleaning service if you are limited on time. 5. Make your property easy to show. The more flexible you can be with showing times, the more people can see your home and the quicker you can sell it! Also, leave before a showing. Potential buyers want to be able to feel free to walk around and look at a property without feeling like an intruder and they want to be able to discuss pros/cons with their Realtor honestly. 6. Remove your pet. And remove all their clutter. A potential buyer should not even know there is a pet in the home, if you can help it. This will open your home to more potential buyers who might be put off by pets. 7. Make sure your listing is on all the major online portals. This is your Realtor’s job, but it doesn’t hurt to double-check and to push it on your own Facebook profile or other social media. 8. Make sure your listing has excellent photos. If your agent (or you!) is taking photos with a cell phone, that’s not a good sign! When you search for homes online, what do you look at before you even consider going to see it in person? The pictures! 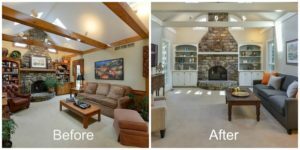 Good, clear photos will attract buyers better than amateur snapshots! 9. Share information about not only the home, but your neighborhood as well. You’re selling not only your home, but a lifestyle as well. List the amenities, such as nearby schools, parks, shopping centers, restaurants, access to freeways, walking paths, etc. Again, this is your Realtor’s job, but make sure to let him/her know all your area has to offer.